Is Mexican Coca-Cola the “real thing”? That’s been a persistent question since the Coca-Cola Co. changed its original formula in 1985, replacing it with New Coke. A few months later, after petitions and boycotts, the company acknowledged its blunder and re-marketed Coke made with the old formula. They failed to mention, however, that Coca-Cola Classic, as it has been known since then, wasn’t exactly the old formula, because it no longer contained cane sugar. Instead it was sweetened with high-fructose corn syrup (HFCS). Regardless, sales skyrocketed and order was restored to the universe. 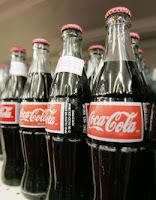 Now, decades later, iconic glass bottles of Coca-Cola sweetened with cane sugar have been appearing on store shelves around the U.S. Ironically, this arguably more real version of the real thing happens to be made in Mexico, where soft-drink bottlers still use cane sugar. The surge of popularity of Mexican Coca-Cola in the U.S. doesn’t make the corporation happy, partly because of territorial rights, but more important, because cane sugar is a more expensive ingredient in this country than HFCS, thanks to tariffs and farm subsidies. HFCS is cheaper because it comes from corn. The sweetener is made in a complex process that uses enzymes to partially convert nearly pure glucose corn syrup into fructose; the fructose is then recombined with glucose to create a high-fructose mixture of varying percentages, depending on the intended use. The soft drink ingredient, for example, contains 55 percent fructose and 45 percent glucose. Cane sugar, on the other hand, is sucrose, a disaccharide of glucose and fructose obtained from sugar cane, which is not widely grown in the U.S.
Manufacturers of cane sugar contend that it is a “natural” sweetener and HFCS is not. The FDA hasn’t yet determined what “natural” is. However, the Center for Science in the Public Interest threatened a lawsuit against Cadbury Schweppes for claiming that 7Up, which contains HFCS, was “all natural” — and the soft-drink manufacturer changed its label. Some scientists claim to have identified compounds in HFCS that lead to obesity and diabetes, and they are concerned by the genetically modified components in corn and in the enzymes used in the conversion process. Other scientists counter that HFCS has exactly the same calories, component sugars and taste as cane sugar, and that there is no conclusive evidence that it is more harmful than any other sweetener. In fairness, it should be noted that excess consumption of cane sugar isn’t recommended by dietitians, doctors or dentists, either. It may be the total of all the sugars we consumethat is causing the increase in diabetes and obesity in this country. Health issues aside, what about the taste? Mart Martin, a spokesman for Coca-Cola’s North American division in Atlanta, says there is “not a perceivable taste difference” between U.S. and Mexican Coca-Cola, according to the San Diego Union Tribune. To find out, we conducted a blind tasting of Mexican and U.S. Coca-Cola with the help of the Culinary Institute of America in San Antonio. Unmarked samples, both taken from glass bottles, were served to the students and faculty, who rated their relative sweetness and overall flavor. Interestingly, people who had been raised in or near Mexico often instantly identified the Mexican Coca-Cola and universally preferred it, while those raised in the States preferred the U.S.-made Coca-Cola. In other words, we tend to like what we’re used to. One thing that wasn’t tested is how much influence the shape of the Mexican Coca-Cola bottle and the label might have on taste perception. After all, nostalgia is a thirst for something sweet from the past. Mexican Coca-Cola is available at Central Market and some Mexican restaurants and markets.